FireXPlus is a nontoxic and environmentally safe fire extinguishing agent which delivers a powerful, three-pronged attack when used in both Class A and Class B firefighting applications. To see video of FireXPlus in action visit our download page. FireXPlus is EPA SNAP listed as a water-based surfactant foam which is acceptable for fire extinguishing in both occupied and nonoccupied spaces. FireXPlus is accepted by the National Hot Rod Association (NHRA) for utilization in all racing classifications and is available in convenient and easy-to-store gallon pails. 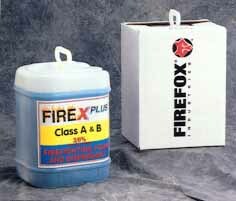 FireXPlus is an excellent enhancement to any on-track fire safety program whether using FireXPlus with FIREFOXs portable fire extinguishers, premixed or educted on a pumper unit, or educted directly from a 5 gallon pail.